Where do you go when you're already at the top? This must be the question constantly nagging Nike Footwear designers whenever they are tasked with redesigning their greatest creations. The first Magista was an unprecedented boot for the football world when it was released in 2014. The Flyknit upper and Dynamic Fit Collar were innovations that spurred an ongoing trend of knitted uppers across the entire industry. Once again we wonder, how do you top that? 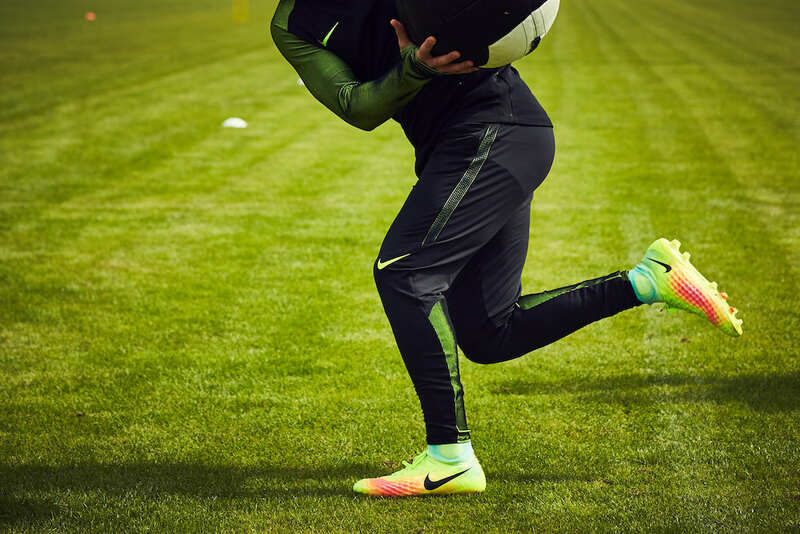 In order to answer that question and evolve the Magista, Nike football designer Phil Woodman turned to the Nike Sports Research Lab for help. Using data gleaned from slow motion film studies of ball control, the team was able to determine which areas of the feet are the most touch-sensitive and receive the most ball touches. These areas were heat-mapped onto all of the Magista 2 prototypes, and also served as inspiration for the colorful pattern featured throughout the upper of the finished product. The major difference between the first generation and second generation Magista Obra is the upper texture. The first generation featured a uniform texture that was laid over the Flyknit upper. To improve upon this design, Woodman focused on those heat-mapped areas to begin 3D printing Flyknit uppers infused with a variety of textures (as opposed to layering them on top). The many iterations came together in a final version of the texture that features a mixture of peaks and troughs for optimal ball control and touch. Additional design details include a new Dynamic Fit Collar that contours lower on the ankle in order to free up space around the tendon, and a new stud configuration that mixes conical and bladed studs in strategically mapped areas around the lightweight soleplate. The Nike Magista Opus 2 and Onda 2 will be available in the Soccer Shop and online here. The latest release from Adidas for the 2016/17 season has catapulted the legendary brand to the top of the industry in terms of design and innovation. The Speed of Light Pack features all new releases of their three silos dedicated to speed, agility, and control. The X 16.1 has been redesigned for 2016 with a streamlined upper built without seams and stitches. The new aerodynamic shape features an extended sockliner for a sleek and tight fit, and the techfit upper material guarantees zero break-in time. The X 16.1 is available in an eye-popping Solar Red and silver colorway. Messi's boot of choice has also been redesigned for 2016, now featuring a monotongue construction for a complete lockdown fit and a flexible agilityknit upper that guarantees no wear-in time. The unique stud configuration was developed with feedback directly from Messi himself, and features a combination of strategically-placed conical and bladed studs. The Messi 16.1 is available in a total Shock Blue colorway. The Ace 16.1 Primeknit continues to be the pinnacle of comfort and control for the Adidas range of boots. The boot features a completely Primeknit upper with a NSG (Non-stop Grip) coating for control in all conditions, an extended primecut ankle sock for added stability, and a lightweight sprintframe with a conical stud configuration. The Ace 16.1 Primeknit is available in Solar Yellow and black. The Adidas Speed of Light Pack is available in the Soccer Shop and online here. After a summer of vibrant new releases, including the Nike Superfly V and Magista Obra II, Nike takes a subtle step back and cloaks all of their silos in black for the Pitch Dark Pack. This isn't the first time that Nike has blacked out their colorways- the previous Stealth Pack was so popular that Nike released it on two different occasions. 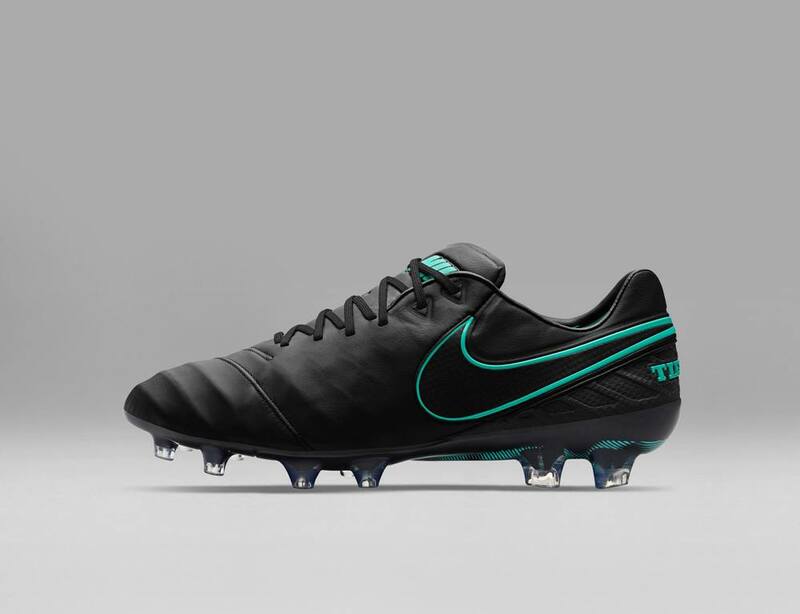 The all-black colorways are normally not worn on-pitch by professionals, but players will wear blackout prototypes of new boots for product testing, which has added to the popularity of Stealth Packs. The Pitch Dark Pack is not a complete blackout. With vibrant pops of color showing up around the Nike Swoosh elements throughout each silo, this is sure to be another fan-favorite. We can't foresee the lights going out on these blackout packs any time soon. The Nike Pitch Dark Pack will be available in the Soccer Shop and online here in adult and youth sizes. The second release of Nike's Tech Craft Pack features classic white and black uppers. The Tech Craft Pack is a modern innovation of the traditional Kangaroo leather designs utilized in soccer boots for decades. Thin, durable layers of leather are fused directly to the Flyknit and Synthetic uppers of the Magista Obra, Hypervenom Phantom and the Mercurial Superfly, while the Tiempo Legend continues with its everlasting all-leather design. The Tech Craft Mercurial Superfly & Vapor, and the Tiempo Legend VI will be available in The Soccer Shop and online in adult sizing.